GBB performed a transfer station siting study for the Department of Environmental Resources of Prince George’s County, Maryland, one of the largest counties in the Washington, D.C. metropolitan region with an area of over 500 square miles and a population of 820,000. The primary objective of the study was to evaluate sites and their suitability for use as a transfer station. GBB developed conceptual transfer station plans for a single and a dual transfer station options to process the 423,000 tons of residential solid waste that the County collects annually. The conceptual designs were based on key strategic factors and on the County’s requirements, including capacity, multi-modal capability and aesthetics. 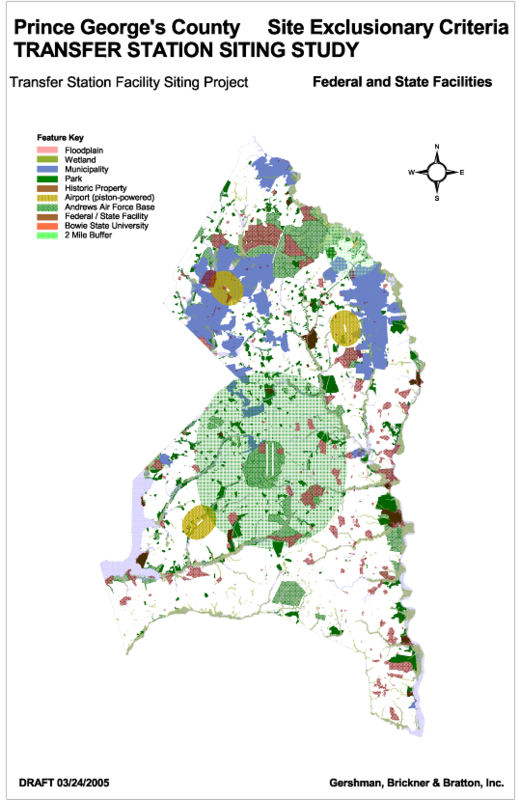 Exclusionary screening criteria were identified and review with the County and included Chesapeake Bay Critical Areas, wetlands, flood plains, land use and air traffic restrictions. Prince George’s County is the location of Andrews Air Force Base which is home to Air Force One. After screening the County to eliminate sites based on the exclusionary criteria, nine functional siting criteria were developed to use to rank the sites. Individual sites visits were conducted by a GBB team of experts to address the suitability of each site of the 25 based on their professional assessment. No physical analyses such as borings were made. The sites were scored against the nine criteria and recommendations made in the final report. The final report was presented to the Prince George’s County Council Committee addressing the most suitable sites, their advantages and disadvantages, and their suitability for use as a transfer station site. The County Council has not yet made their decision.